I wasn’t going to bake any biscuits or cookies this Christmas. I usually bake a selection of biscuits, which I decide on in the weeks leading up to Christmas – Oreos, Greek Easter biscuits and Graham crackers are some of my favorite festive bikkies. But this year I was going away on the 16th of December and I just didn’t feel up to rushing around and baking in the heat and humidity. When I told my niece I wasn’t baking biscuits this year she was devastated. It was like I’d cancelled Christmas. Nonetheless I felt committed to not baking, I made batches of lime cordial and tomato ketchup as homemade gifts, bought & wrapped presents for my family and felt very smug about being super prepared for Christmas this year. Then my friend Jenny (who comes from a family with awesome cake recipes) unearthed her grandmother’s shortbread recipe and baked a double batch of these for a picnic. She even considerately bought cellophane bags for people to take home leftovers, but by the end of the day there was only a couple of dozen shortbread to divvy up. The shortbread eclipsed the Cherry crumble cake (also baked by Jenny) and the seriously stupendous chocolate panettone I’d bought from Haberfield bakery. When Kerrygold butter went on a half price special at Coles, the lure of baking shortbread became too strong. So instead of my usual smorgasboard of Christmas cookies I settled for baking just one biscuit. 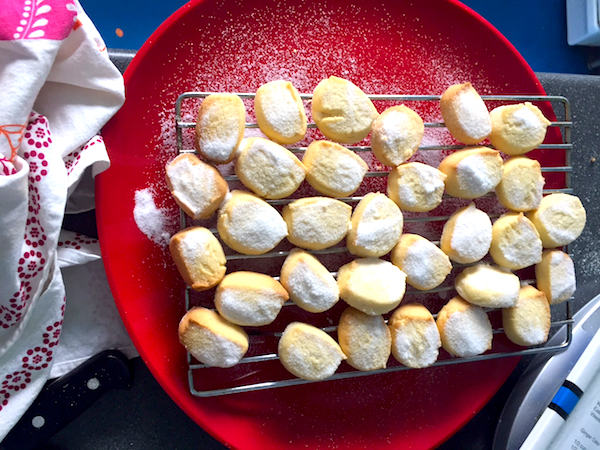 These are a very textured, crumbly shortbread made with a mixture of rice and plain flour. 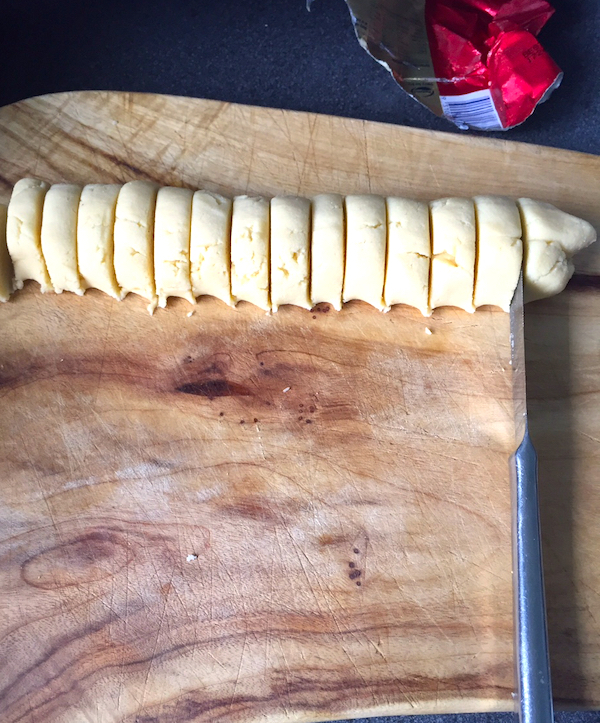 There’s also the excellent grandma’s trick, of cutting the shortbread with the blunt edge of the knife, giving an extra rippled surface to the biscuit. Castor sugar sprinkled on top of the still warm shortbread melts a little and sticks into the crevices on top, giving another textural crunch to the shortbread. They’re so good. These are vanilla shortbread but you could experiment with different aromatics and flavors, but then, why mess with something that’s practically perfect. Christmas is a time of overeating, but you can always make room for one of these shortbreads or two or three or four . Notes on recipe: You can double or triple this recipe. In the extreme heat of summer baking you may need to place the dough in the fridge for half an hour to make it easier to shape and roll. Don’t let it get too hard because it won’t cut with a rippled surface. After shaping and cutting the shortbread I often place them plastic containers between sheets of greaseproof paper and bake them off later, when the cool change hits. Beat castor sugar, butter and vanilla until creamy. Mix together flours and add to butter and sugar. Mix until well combined. Place on greased trays or baking paper. 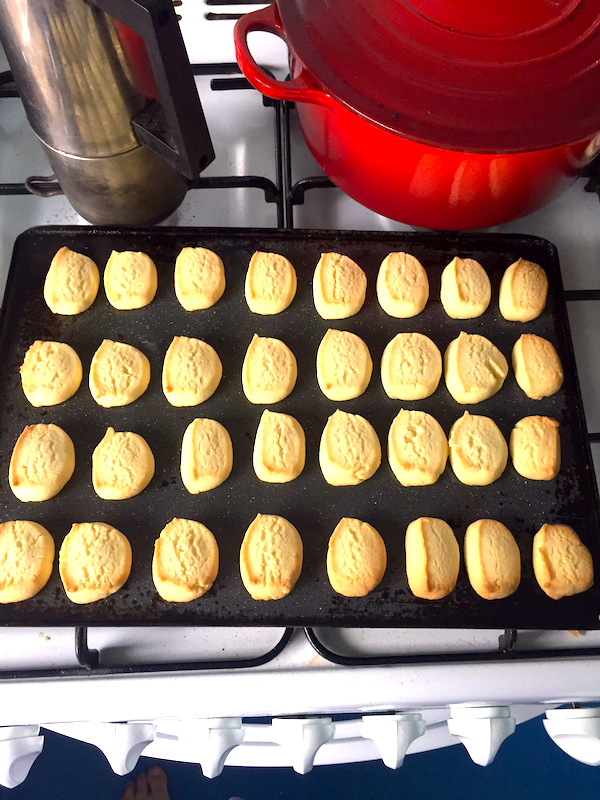 Bake in a moderate oven until golden (about 20 to 25 minutes) Remove shortbread from trays and place on wire rack. While the shortbread is still warm sprinkle with castor sugar. Allow to cool completely and place in airtight tins to store.